We are often asked for health advice and thought it might be useful to give you some guidelines on how best to assess a hen that appears unwell. If you need to talk to a vet having some information to hand can be useful, and may help with diagnosis and treatment. 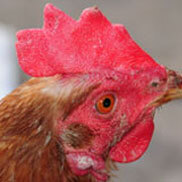 Our advice is to regularly check your hens through handling them and become aware of the following points. 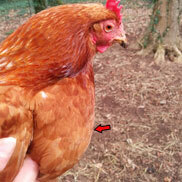 Always check a healthy hen first, then the hen that appears unwell so you can do a comparison. 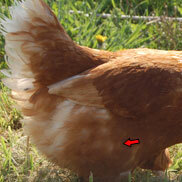 The comb sits on top of the hen’s head and should be red, plump and glossy (this often denotes she’s in lay). If it’s pale, but plump it probably means she’s healthy but off lay. If it becomes dry, shriveled or flaky; that’s a indicator of poor health. This is the bone going down the centre of the bird and should be well padded with flesh either side. 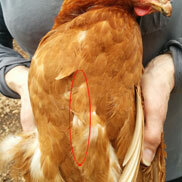 If it protrudes, it means your hen is thin and can denote problems; don’t be fooled by a nice set of feathers, they can easily disguise a thin bird. This is where the eggs come out. It is also her bottom! Firstly it should be nice and clean; if it’s a round ‘hole’ it means she’s off lay, if it’s elongated (like a slot) it means she’s in lay. 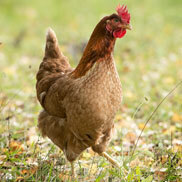 If it’s dirty your hen may have an upset tummy or an infection. This is your hen’s ‘shopping basket’ where she gathers food to be ground down and passed through to her stomach. Situated at the bottom of her neck, the crop should fill up when she eats and slowly deflate as she passes the food through to her stomach. It should be neither too packed solid with food (that can indicate an impacted crop) nor full of fluid (that can point to sour crop). The abdomen area should be rounded and soft, but not feel unusually large. 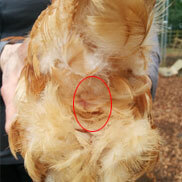 If it is swollen and your hen’s legs are slightly splayed feel if the abdomen area is hard and solid or soft and full of fluid. A hard, solid abdomen can denote egg peritonitis and a soft abdomen can denote ascites (fluid in the abdominal cavity). A healthy hen should be busy and active, scratching the ground, feeding and drinking well (though not excessively) and preening. A poorly hen will stand hunched and disinterested in her surroundings, although sometimes wet or cold weather makes them hunch and appear cheesed off; just like us they don’t like the cold and wet!